Yanora Enterprises is a full service company comprised of three divisions which are Pennsylvania Water Specialties (PAWSC), Sky Mechanical, and Yanora Underground Technologies. 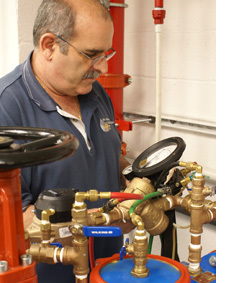 Our specialties include: Water Safety & Distribution, Backflow Service and Training, HVAC, Power Backup, Leak Detection and Line Location. Our highly trained and experienced staff all have at least 10 years of experience. Our company owner and president has over 35 years of experience in the water, wastewater, and natural gas industries. PAWSC offers 16 PADEP approved courses for water and waste water operators ranging from 4 to 32 contact hours for training. Our mission is to provide top quality professional service, quality water and wastewater products and training. Please take some time to check out our new web site to see what services, training, and products we offer. You can contact us at either our Main office in Pittston PA or at our satilite office for Western PA in Grove City. We have a mobile training program that will come to a site of your choosing provided there is an adaquate demand for training at your site. Contact Ralph (see below) to set up one of our 16 PADEP and/or ASSE approved training courses.